Great stage ones! Looking forward to the rest and to see if you all benefit as much as I did from gaming Arccos! Thanks and am looking forward to your reviews and thoughts. Nice stage 1 fellas. Looking forward to seeing the results of your testing. I am very interested in seeing these results, I have been trying to decide between Arccos and Shotscope, and this will help me decide. Have fun with this one. A quick update for everyone. I can really see how the system is designed to collect data and provide you with usable measurements to improve your game. I like the potential that it is showing. This is the trouble that I have been having lately. This was from a scramble on Saturday. I played my 3 wood, 56Â°, and then 1 putt. 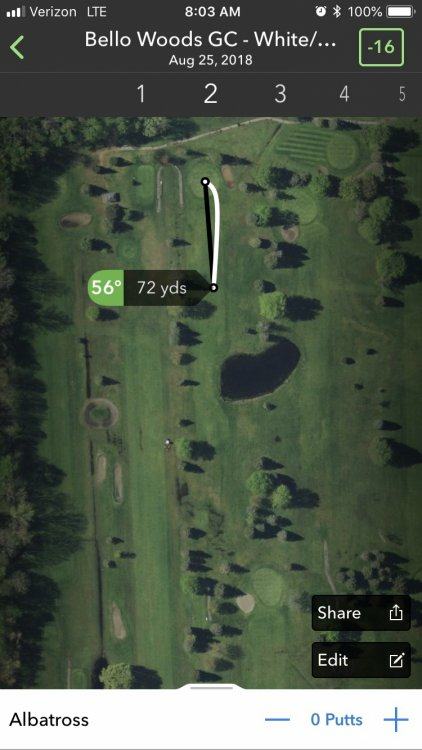 I did not hit my 56Â° 72yds. It was about a 25yd chip. Arccos is only registering one or none of my strokes and seems to be all over the place with distances. I'm in an email conversation with their client experience team to find potential solves. I've experienced the of drop in shot as well here and there, however I found a few keys being if the green and next tee box are close then be sure to take out your next club by the tee box and not earlier. For me at my local course 13 green and 14 tee box are very close and the odd time I would take out my 4 Iron right away from walking off the green and it wouldn't end the previous hole, but continue on. Also usually a quick review after the round usually helps any real outliers. I know that caddie feature is a huge part of your review, but has anyone checked out tournament mode? I haven't played around with tournament mode yet, but I plan to as I'm sure many people are curious about that feature. My dropped shots occur all over the course and even when I only have one club with me and the cart with my bag is 15-20yds away. any thought of contacting Arccos and finding out about this? Still in the middle of gathering data for my Stage 2 and thought I would add my thoughts on lost shots and false shots, The quick start guide gives a few tips to avoid the false shots being triggered, if you drop the club or bump two clubs together can trigger false shots. It looks like also if the green and next tee in close vicinity to each other (as Danbrook posted) it can miss your drive. This is no different from Shot Scope in this respect which for different reason is not 100% accurate and gives false positive and negatives. I found in the first couple of rounds trying to confirm and correct hole scores was a distraction from my golf and decided not to rely on accuracy of the stroke recording and now spend 5 minutes at the end of the round double checking the data and correcting it while the round is still fresh in your head. On Tournament mode I've used it a couple of times, it says it conforms to USGA tournament rules but to feel comfortable using it I'm going to check the R&A site. You still get the Caddie view at the tee and the GPS satellite view of the hole gives you wind speed but not elevation. Also the Front Centre Back view no longer gives you the second set of numbers i.e. Plays like yardages. After 12 rounds I've found the Data Analytics and Dashboard the most useful features and I'm using this to focus my practising. Personally the Caddie feature so far I'm not sold on, the main reason is that I won't rely on it 100% and because of this using it adds doubt on club selection into my head. For example playing a hole that has a 30 feet elevated green I usually take yardage to the back of the green and club to this, so it plays 10 to 15 yds longer and you are always better long than short. My head says PW, I pick out Arccos and it says AW. AW will get me there but if I hit it heavy it will be short and roll back down the hill 50yds. Doubt is a terrible thing. Also if you start to rely on it and then go into a tournament the Plays like feature is disabled so you have to work it out yourself from F-C-B data. Here is a question, what happens if you don't have a phone signal does the phone still gather data? I'm going to put my iPhone into Airplane mode the next time I'm out and check. I use a older iPhone that doesn't have any service, as I found arccos misses a LOT more shots on Android. The only downside to a no service phone is no wind conditions other then that it works just as a phone with service. In regular mode the caddie still functions as normal and you still get all your F - M - B yardages along with club suggestions. At least those are the only differences I found between service and no service devices. Side note I've emailed arccos on a few different issues/course updates and I don't think I've ever had better customer service. Responses have almost always been same day if not hours after. That and the few courses which needed to be updated only took a few hours to do. I'm in an email conversation now with Arccos to try and find out why this happens. I found in the first couple of rounds trying to confirm and correct hole scores was a distraction from my golf and decided not to rely on accuracy of the stroke recording and now spend 5 minutes at the end of the round double checking the data and correcting it while the round is still fresh in your head. I 100% agree that confirming and correcting the data hole to hole is distracting. I too have done the method of double checking everything after the round, but at that point it is no different than my stat tracking I was doing at the start of this season. So far I haven't registered a false shot. All of my struggles come from a shot not being triggered. I have played entire holes with no shot being triggered. I'll keep everyone posted with what Arccos says. I agree that their customer service is very responsive. It is nice to see that still matters and is thought of by companies. I think I am in a different camp. The times that I have played with the Arccos system - I put the phone in my pocket and didn't look at it once... hmm. I would like that to be the way that I use the system. Just take the phone out to check distances and then back in the pocket. I'm hoping to solve the technical problems and get to the nitty gritty of my golf problems.